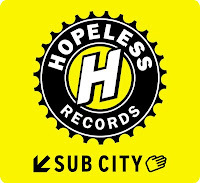 Losing All Time Low to Interscope Records must have pushed some sense into Hopeless Records. Since that loss, they have been on fire, signing three very well known bands and one lesser known, but still solid band. Yellowcard's recent reformation seems to be a perfect fit for a huge Hopeless release. Silverstein seems to be an odd fit for Hopeless, but they're another band that the label knows will sell records. The Wonder Years let out one of the most acclaimed pop-punk records of the year with an album that will be in my top ten. Divided By Friday is a solid pop-rock band that I've known for a while, and is finally getting the credit they deserve. Along with personal favorite There For Tomorrow (whose remix EP is actually solid for a remix EP), The Dangerous Summer, and We Are The In Crowd, Hopeless definitely has one of the most solid rosters among indie labels right now. You can check out the label and their releases on their website here.